The Bundesliga regular season had ended on May 1st with a tie between my team of Baden-Baden and Solingen. The rules required a playoff to be played as soon as possible. 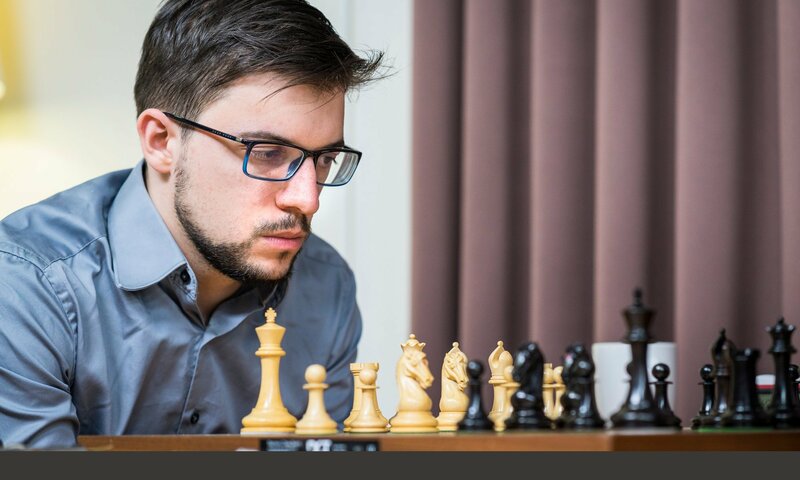 Despite the normal difficulties to organize such an encounter where numerous world-class players are involved, the date of Thursday, May 24 prevailed; in particular, it had the advantage of being located just before the Norway Chess super tournament in Stavanger, where a few protagonists of the Germanic duel were expected to land next Saturday. 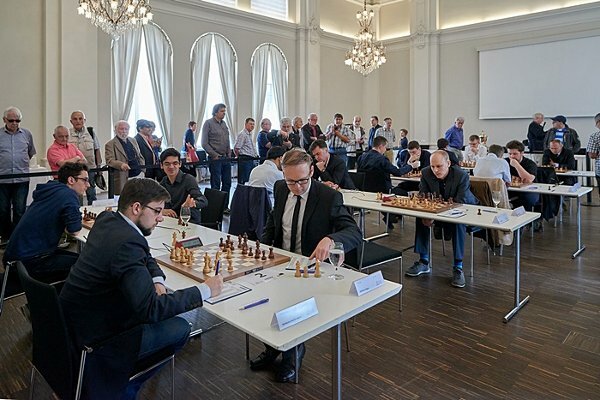 Thanks to our lead in the game points tiebreaker, we were welcoming the playoff in Baden-Baden, and it took place at 3pm inside the town large cultural complex. Placed on board 2 behind Caruana, who by the way made his season’s first appearance, I thought I would play against Rapport with white, as Harikrishna, my opponent in the regular season’s match, was in China. But finally, it’s the Austrian Markus Ragger who sat in front of me, and who chose to play the same Berlin line that Howell already tried against me on the previous weekend. On my way to a Berlin against the Austrian Markus Ragger (photo: schachbundesliga.de). I was the first to deviate, opting for the 12.b3 variation, against which he reacted a bit weirdly with 12…f6. Black instantly admits that he’s going to play with a bad structure and open lines, although it is true that he keeps the Bishop pair, with a still solid position. Certainly, I allowed him to repair his damaged structure and to switch to « opposite coloured Bishops mode », after the exchange 22.Nxd6+. But I believe he underestimated the blocus of his pawns on dark squares after 26…Nxe5 27.Nxe5 fxe5 28.c3!, leaving me with a potential lever on each side. 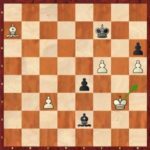 After 28.c3!, three white pawns control four. Unfortunately, I took a wrong decision, thinking I was going to win after 49.Kf4? Bxh5 50.Kxe4, which was not to be. Instead, I should have kept my h pawn and played 49.Kh4! which actually wins. A crucial moment: 49.Kh4! wins, but not 49.Kf4?. After 49.Kh4! Kg7 (49…Kf6 50.Be3 Kxf5 51.Bxh6 ou 50…Kg7 51.f6+ is also hopeless, Black will not cope with both the c and h pawns at the same time) 50.Be3 Bc4 51.f6+ Kh7 (51…Kxf6 52.Bxh6 and again, the two passers make all the difference) 52.Kg4 Bf7 53.Kf5 Bxh5 54.c4!, the strenght of white pawns prevails. In the game, I had to keep my pawn on c3 as if I rushed to push it to c5, Black’s King would have blocked it on c6. Thus, even after taking his last pawn on h6, the position wasn’t winning anymore, despite my two c and f pawns remaining. Indeed, the Black Bishop stays on the a2-g8 diagonal, and the Black King navigates between e8 and b5, preventing any advance of the c pawn, while keeping an eye on the f pawn. 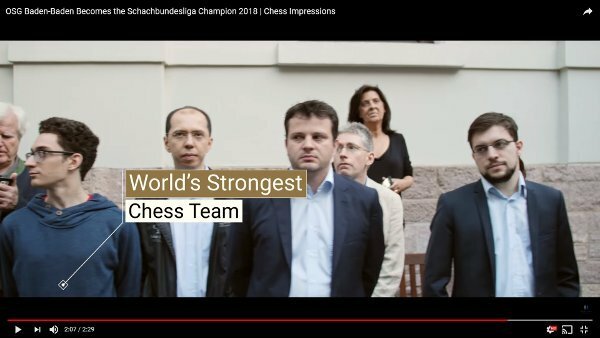 With Etienne Bacrot, two frenchies in the world’s strongest chess team… (Video: Baden-Baden). 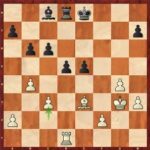 It is always frustrating not to convert a winning endgame, but the important thing was that my modest half-point could contribute to the win of the match. And so it was, as we won 2-1, although the final score doesn’t reflect the overall match. We had better positions on most boards, and we lost the only one where we were slightly in danger (Giri beat Caruana). 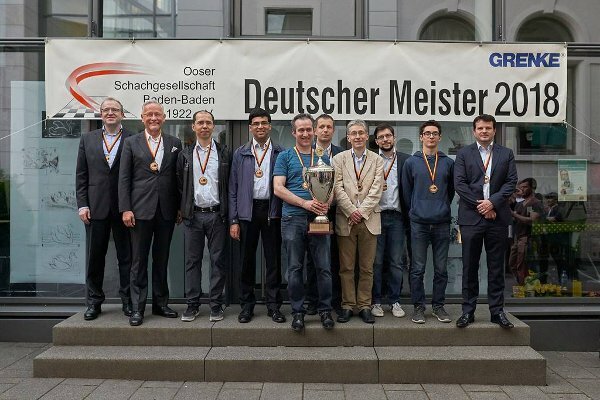 With this victory, Baden-Baden is again German Team champion in 2018, for the twelfth time in thirteen years, matching the absolute record held by… Solingen. That looks like a ready-made challenge for the next season ! Twitter Maxime flew to Stavanger (Norway) on Saturday 26, where the famous « Norway Chess » tournament will begin on Monday 28. 8 of the Top10 players are announced, alongside with Anand and Aronian (and yes, both are currently out of that list !). When the tournament begins, Maxime will probably have reached the 20.000 followers mark on Twitter. A relatively modest figure, if you compare it to the best chess players active on this network but, to this day, how to fight with a serial twitto (Giri, 40k), a reigning World champion (Carlsen, 189k), and a living legend of a whole subcontinent (Anand, 536k) ! Previous PostPrevious MVL inspires them ! Next PostNext Hello again, Stavanger !